Vera&John (VJ Casino) Got a Brand New Look! Discussion in 'Gambling News' started by Marina, Nov 23, 2016.
generous promotions and brilliant online games. Now there are even more reasons to visit this site, thanks to a brand new look for the Vera&John Casino. Management at this site was excited to announce this week that Vera & John Casino is getting a makeover! “The V&J team has been busy redecorating lately, and we just can’t wait to show you around our new and improved website!” announced the team. So what new features can you expect to find at the online casino? Filters & Search: We all know that a pleasant experience at an online casino begins with being able to find what you are looking for in a fast and convenient way. Vera & John Casino have improved their filters, making it much easier to search for – and find – exactly what you are looking for. The site has listened to suggestions made by its players and implemented them. For example, you will now be able to search for casino games even when you are not logged in to your account. You can also search by software - just type the name (i.e. 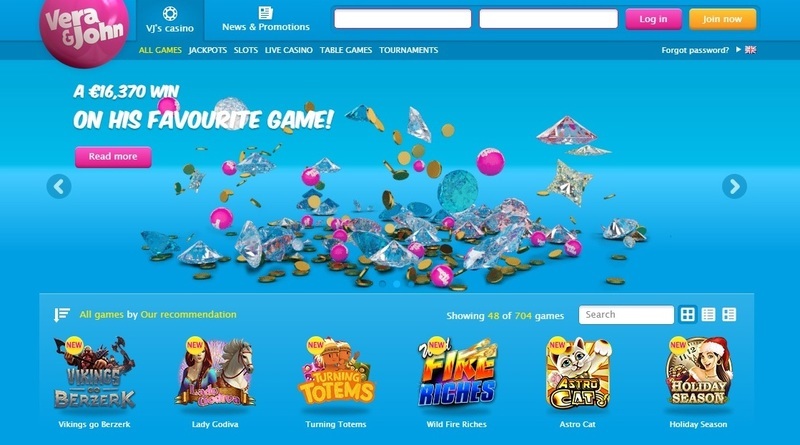 Microgaming, NetEnt, Quickspin...) in the search box and you will see all games from this provider. Personalized My Casino: Vera & John Casino have added a personal touch to your gaming experience by introducing a My Casino space. By accessing this space, you will be able to see any special offers or free spins directed to you only. You will be able to count your playing badges and see your achievements progress, as well as look up your highest winnings. shop offers and game rules,you can simply browse these pages without needing to leave your game. Bankroll Management: A good gaming experience begins and ends with sound money management. The new and improved coin information page at Vera & John Casino allows you to keep track of how much cash you earn at the casino and how much you spend. The page will also provide information about new promotions, as well as winner stories to inspire you! her out €29,430 and since she was also the biggest winner of the month, she had her rewards topped up by €70,570 thanks to the site’s Guaranteed Winnings policy. told that for those two days, she was also the daily Guaranteed Winner with the highest wins, and Vera & John Casino added another €2,000 to her prize total! Djinn777 and Mike like this.